Charles sighed… Yet another thing to check before he could head for the Wyld! It was his own fault of course – if he hadn’t been running so many projects at once there wouldn’t be so many needing to be checked on – but he’d better see whether or not any of the other Kickaha had been up to anything that needed fixing – or was just seriously naughty. He’d given them power, so what they got up to with it was – at least in part – his responsibility. Oramure had been assigned to monitor the dragon lines of the Brazilian prairies and had decided to do some recreational hunting in the wilderness. What he’d thought were wild horses were, in fact, actually owned by somebody. Unfortunately for him, that somebody was apparently magically powerful enough to capture the kid – and to give the watcher in Aden a little trouble with the tracing. Not too much, though; they had managed to get his location – behind some wards in a remote part of the grasslands. Oops! That was DEFINITELY a “sorry, can we make it up to you” thing… How could the kid have mistaken horses that were presumably decently cared for for wild ones? Perhaps he had just been overexcited and hadn’t looked closely enough? Charles headed that way with an apologetic Kickaha in wolf-form in tow. The pack Alpha sent Cedric – the pack Beta – in his stead as a subtle snub directed at Oramure. Evidently the Alpha thought he’d been rather dumb. Still, Oramure was just a boy, and an attempt to get him off the hook was definitely in order – unless whoever it was just had him working as a herd dog. That would… well, it would really be fair enough. 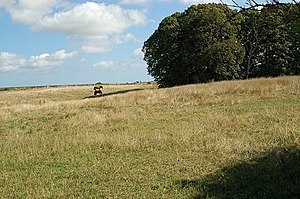 The location was a wood-aspected manse-ranch hidden deep behind thaumaturgical wards in a remote part of the grasslands. To mortal eyes, it would appear to be little more than a small ranch with the usual features: lots of fencing, standard facilities, and a modest house. That was a cover; it was easy enough to see that the Manse itself was in one of the fenced in areas – and the horses and cattle were fine indeed. There were hands, herders, and other workers who wanted to talk with him as he approached the compound though. Those assigned to that particular part of the ranch seemed to be highly alert. He didn’t actually add “And how did you get here in the first place?” – but the thought was pretty obvious even to Charles. Cedric wagged his tail appealingly. Ah! The supervisor, at least, knew some things… He wasn’t going “whaaa?” to the notion of a dog being sent out to do something. That hand rode off toward the small house. A few minutes later, there was a thaumaturgical message sent to the Manse – and another to the supervisor. They headed off… The entrance was through a hidden tunnel in the smaller house, and it emerged into the Manse proper, made entirely from toughened grass. It swayed gently in the wind. As a Manse, though, it was – of course – as hard to break as stone. It also seemed to be geared toward animal breeding – and Charles thought it was extremely neat! He hadn’t seen any other manses built with basket weaving! The entry floor was devoted to housing the supernatural animals. Madame Barbosa had to have a deal with at least one god; some of the horses were clearly more than mundane animals. The stables and pens are of utmost quality and do not stink in the slightest. At least one horse was Sapient, but he was very comfortable and content in his personal stabling – although he was looking at Charles with some interest. It was a small rank-1 Chancel, set up to provide a beautiful nature-preserve area. The supervisor checked it; he knew some thaumaturgy, although he was nowhere near an expert. He gave it to Sirocco when he determined that it was safe. The “stairs” were more of a basket-escalator. There were fine medical facilities, kitchens for the horses, and even places to store their excellent gear… and those were just the areas the supervisor was letting Charles see. The living quarters and meeting area were on the top floor. It wasn’t a very tall Manse. Once he was up there, Charles could feel… a fairly strong Wood Aspect signature coming from the back, along with a comparatively low-powered Solar one and a standard Kickaha. The Wood and Solar signatures were… coming his way, while the Kickaha one remained where it was. Fairly soon, as Charles and the supervisor emerged in a lobby area decorated in teak and silk, Charles encountered a familiar face – Mr Romero! Charles hadn’t seen him since that mess with the manse and those three Abyssals in South America! He… was tracking something with an occult device. Behind him, with a small entourage, was a tanned woman with graying auburn hair: the source of the Wood signature, and presumably Madame Barbosa. Meanwhile, Romero had perked up at the mentioning of designing Manses. He produced a globe-projection with their various current locations marked to see what they were up to at the moment – although, after a very recent lecture, they were probably on the job. Earth had mostly been teenage boys. Monitoring and security in Aden had gone to the smaller kids and pregnant girls, while a few of the older males were on extrasolar surveys on the new planets he’d been setting up (for a ground-level view to compliment the geosurvey satellites) – although there had been some requests to do true exploration work and there were a few who didn’t have jobs yet. Charles came up with some minor-artifact collars – roughly equivalent to the Resplendent Butler’s Accouterments as collars – and quietly inquired as to what Searunner had been like… He really was sorry about that! A pet would have been bad enough, but if she’d been a companion for Sirocco, she’d presumably been another fully-sapient type. Searunner had been a Familiar-5 God-Blooded horse. Her divine parent was Seven Grasses Silent, the god of Brazilian horse breeding. She couldn’t exactly run on water, but she wasn’t impeded by running through it, and could breathe in it. Oh dear! That meant sending apologies to Seven Grasses Silent too – even if he had to be very used to losing god-blooded offspring. Seven Grasses Silent appreciated that, as used to losing offspring as he was. As a long-term way to bring the Brazilian horse-breeders to the top it had it’s price – but it HAD steadily (if fairly slowly) been expanding his domain. The god-blooded powers faded in a few generations as a rule – but the top-quality genes and little tweaks he added to them did not. Charles… wasn’t quite willing to make fully intelligent horses to give away. Still… A quick request to Elzeard, and a little shaping, and using the Mardi Gras Fey to get some enhancements and mutations set up on them, made it easy enough to come up with a dozen roughly-equivalent mares and use a wyld gate to bring them in. Barbosa was quite willing to accept that. With the Manse’s facilities, she could speed up the gestation on their foals – and it would help her finish her breeding project before she died. For a Terrestrial, graying hair meant that the end was fairly near – usually within a decade. Charles caught that thought… Oh, that was true! He’d almost missed that! He hadn’t really dealt with many Terrestrials very much! (Charles) “Well, a manse-link is simplest – but the thaumaturgical upgrade is better. And you take very good care of all your creatures, so why not? Charles took a detailed look with lifeweaving to see how much longer she had now. It looked like… five or six years. She was a little under three centuries old. Barbosa tested the link just to be on the safe side – then accepted. While Romero was vision-questing, Madame Barbosa was considering the “upgrade”. The power was considerable. Life-extension, healing, assorted convenience powers, computer access, and more? All wrapped up in Celestial-level Thaumaturgy and a new essence type that was… impossibly benign? Hardly impossible to misuse though. That was enough to topple any number of power-balances, draw the attention and cupidity of some EXTREMELY ruthless people, and – however innocently – cause enormous amounts of trouble! And the child was simply handing it out to people he’d barely even met! How could someone so naive have so much power? Hopefully he was controlling access a lot better than he seemed to be! On the other hand… according to her supervisor, he’d just given a pocket dimension to her horse because it was complaining that it couldn’t go out and run. OK, Sirocco was fully sapient and was her best stallion, but STILL. He should have expected her to have heard about it! She was a horse-breeding specialist after all! For a moment Barbosa felt like smacking him! He obviously felt that “cute” was a sufficient reason to do almost ANYTHING. Barbosa considered that for a moment; planets? Was he serious? He seemed serious enough… “AREN’T industrialized yet”?! Did he mean that they were READY otherwise? That was… Well, if he could pull it off, it would certainly defuse a lot of tensions and vastly expand the available resources. Oh of COURSE he meant it; he’d just given a pocket world to Sirocco because he’d been wanting more room to run in! Well… new planets with no roads or industries certainly would call for tremendous numbers of horses! If he couldn’t do it, it wouldn’t be a worry – and if he could, it would be a pretty good thing. So what about those “Aides”? (Charles) “Well, like these!” (And he had some of his current companions pop out). She gently petted the creature – which promptly purred. She was going to have to keep an eye on the Child! Who knew what he might get up to with no supervision! Meanwhile, Mr. Romero had finished his initiation. (Romero) “This should be helpful… very helpful. Thank you, Charles. Oramure – and to some extent the rest of the Kickaha – were in for a VERY strong lecture on predation and on making SURE that your prey was NOT SAPIENT when Charles got him back to Aden! Draining people a bit like the Raksha did was one thing, but actually killing them instead of just draining them a bit was just ICKY and mean! Oramure tried to listen and remember everything. That had been pretty embarrassing! Besides… the thought that he’d eaten an intelligent being was… rather nauseating.